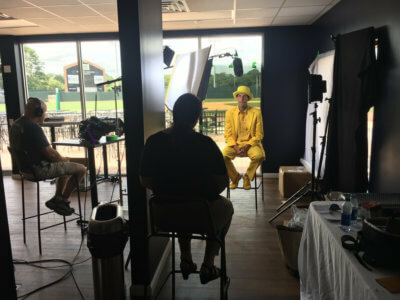 Our Atlanta video crew, Brent Ebell, was in a field of dreams working with MSNBC to showcase the Savannah Bananas, a minor league baseball team in the Coastal Plains League, whose owner has brought baseball back to the city using his unique style and energy. Jesse Cole just wanted to play baseball in the major leagues, but a shoulder injury in college halted that dream. So he had to come up with a new one – own a baseball team! His first step was interning with different baseball teams until the general manager position of the Gastonia Grizzlies in North Carolina opened up. Ever heard of them? They used to be known as one of the worst minor league teams in the country. Cole wasn’t sure what he had walked into. He has always been inspired by showman’s such as P.T. Barnum and Walt Disney so he decided to let them influence infiltrate his new team. He shortened the game and provided non-stop entertainment aside from the ball game. They now call themselves the best show in town. Once he got the Grizzlies up and running he was on to new things. Cole heard about the Sand Gnats minor league team leaving Savannah, so he decided to resurrect baseball in the city. Local support did not start out great – no one was paying attention. 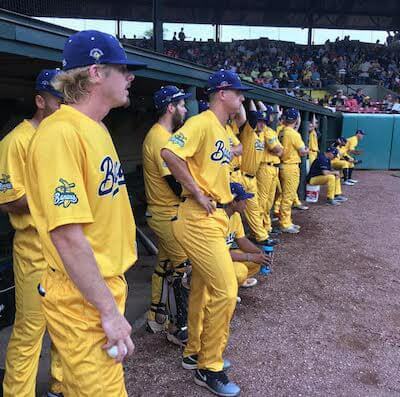 He asked the community to help name the team and they landed on the Savannah Bananas. Cole’s motto: “If it’s normal, do the opposite.” Support began to skyrocket when tickets included unlimited food, tons of giveaways and run of show that “rivaled a three-ring circus.” They even won the playoffs in their inaugural year! Cole spends his time at the games running around in a bright yellow suit hyping up the crowd. His showmanship and entertainment make a ticket to a Savannah Bananas game one of the hardest tickets to get in town. He makes baseball fun! Keeping up with Cole and his energy with a camera on the shoulder of our Atlanta video crew was a fun challenge on this shoot with MSNBC’s “Your Business.” There was never a dull moment while highlighting his journey and the exciting Savannah Bananas game.